In the middle of the night, a 7-year-old boy has gone missing. The crisis has drawn the child’s father Julien (Guillaume Canet) back to a small, snowy town in eastern France in an effort to help. Julien travels abroad for work and has been essentially absent from his son’s life since splitting with his wife (Mélanie Laurent) a few years earlier. Fueled by his sense of guilt about neglecting his family, Julien is determined to do whatever it takes to find his son. That includes using physical force against anyone he speculates could be a suspect in the kidnapping – and disobeying police instructions by stepping outside of the law, as he begins to unfold the mystery of the boy’s disappearance. 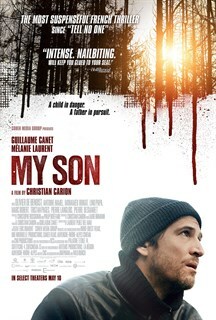 MY SON marks the third and most unique collaboration between Canet and director Christian Carion, whose 2005 war drama Joyeux Noël earned an Academy Award nomination for Best Foreign Language Film. Here, in a remarkable filmmaking twist, Carion made the decision to keep Canet almost completely in the dark about the movie’s plot. The film was shot in sequence over a quick six days. And Canet, onscreen for virtually every minute, was experiencing events, struggling with his emotions, and discovering clues in real time, just as his character was. The result is a dynamic thriller with an added layer of authentic tension. Canet, himself an award-winning director (including of 2006’s acclaimed mystery Tell No One), delivers a powderkeg portrait of a man driven to extremes, with Laurent (Inglourious Basterds) providing a tough, complex performance as his distraught ex-wife. With his most unconventional shooting method, Carion has innovated a bold style of filmmaking – and in doing so has created a raw, riveting and dangerous movie experience.